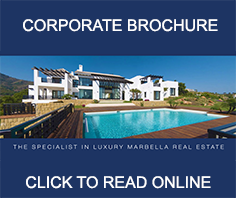 This brand new modern villa for sale is located front line beach in Costabella, Marbella East. The villa offers six bedrooms, four bathrooms, a home spa and a big roof terrace with a gym and a Jacuzzi. Brand New 3 bedroom Frontline Golf Villas at just 900 metres to the beach! Great opportunity to purchase a brand new contemporary villa second line to the beach in Costabella, eight minutes East of Marbella.